How and why it works Fletcher and Munson measured the human ears frequency response on different levels and created an average curve from a test with many subjects. They concluded, roughly speaking, that the midrange is more prominent at lower levels and the response flattens out at higher levels. At low monitoring levels, you will hear the mids clearly but you will miss the high and low-end. That’s why we often see a smile curve on EQ’s and if you listen to a bedroom produced track they almost always have too much low-end and are slightly too bright. All that excessive low- and high-end mask the mid area and when you get rid of that excessive high and low-end you have a mid sharp as a knife. 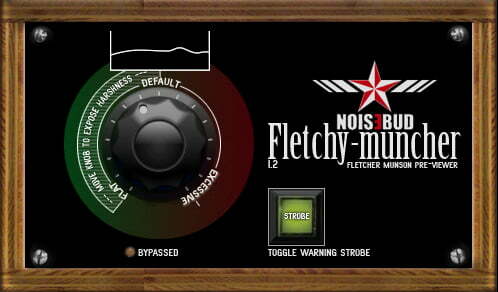 Fletchy-Muncher exaggerates the ears frequency response and makes us aware of the mids in a badly balanced mix. How to use Put it last in your chain and slowly start to move the knob against the ‘Default’ position. A good balanced mix/master should survive all the way to ‘Default’ with just a little increase in harshness. If you find your mix too harsh halfway through you’ll have to go back to the mix/master and use EQ, MB compression or other tools to soften it a bit. Remember to put the plugin at ‘Flat’, bypass it or remove it before bouncing your new mix/master. You only need this if your mixes/masters are too harsh when played elsewhere than in your studio. If that’s not the case this method might cause more damage than good to your tracks. Choose your price & Download!